Please visit The Ojai Unified School District website here for updates, including information on scheduled Board and Special Meetings. and upcoming opportunities to serve on committees. OUSD is pleased to announce the launch of another installment of its communications initiative, a new website platform integrating messaging across multiple channels. A months-long project, the selection of a website platform had several unique qualifiers, noted David Rogers, Director of Operations. “The selection process required the platform to benefit our stakeholders through design that provided an intuitive user experience, with easier access to timely information, such as; school announcements, emergency closures and district news,” said Rogers. "Additionally, as the platform is built with ADA compliance in mind, we were confident Apptegy was the perfect choice for our District's centralized communication system," said Rogers. One example of the platform’s ADA functionality is that the website discerns small details like font color and images to deliver a more positive user experience to all stakeholders. With much of OUSD’s Leadership team investing time in communicating to their stakeholders via multiple platforms, the website selection team sought a better solution; a unified communications strategy with centralized delivery of messaging. “Ultimately, this model frees up our Principals to focus more readily on primary tasks such as staff and student needs, student learning and outcomes,” said Rogers. The new platform will launch on February 1st. For more information on OUSD's new website, please email Director of Operations David Rogers at drogers@ojaiusd.org. Ojai Unified School District is holding a parent meeting to discuss the dangers of e-cigarette use, also called vaping. This informational event will be held Tuesday, February 5, 2019 at 5:30 in the evening in the Matilija Auditorium. While this meeting is intended for parents, students are also welcome. At this forum, we will be hearing from a panel of professionals regarding the impact of vaping. While we hope parents can attend the meeting to give us ideas and thoughts, we have also created a survey (link provided here) to ensure parents have an opportunity to share their thoughts and concerns. The survey will take no more than three minutes to complete, and will convey information to participants, as well as provide Ojai Unified School District with valuable information regarding awareness and understanding of the use of e-cigarettes. As one of OUSD’s goals outlined in the Local Control Accountability Plan (LCAP) is student wellness (goal #4), we also plan on using the information from the completed surveys to determine actions and next steps for educating students about the dangers of vaping. Parent input will help the District to address this issue, and maintain the health and wellness of our students and campuses. While we hope parents can attend the meeting to share ideas and thoughts, this survey is the next best way to make sure your voice is heard. 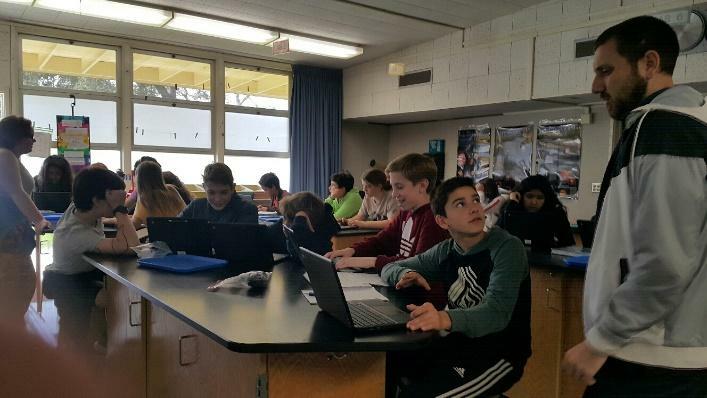 In the Fall of 2019, Matilija will welcome sixth graders for the first time as it adopts a Middle School format. Although the reconfiguration of our schools from K-6th and 7th -8th grades to a true Middle School configuration may seem like a fast-moving project, it has been a topic of discussion and study in our District for more than four years, noted Sherrill Knox, OUSD Assistant Superintendent of Educational Services. “As all changes we consider typically are, this review had a beginning in how well we were serving our students and teachers with the older configuration,” said Ms. Knox. One impetus that prompted this review was the State of California’s adoption, in 2010, of Common Core educational standards. “It’s important to understand that the way the new standards were created is around a K-5, 6-8 and 9-12 configurations,” said Ms. Knox “As the curriculum that is approved by our state Board of Education, and the textbooks that are published around those standards, are built to a K-5 and 6-8 configuration, our 6th grade elementary teachers have less options for curriculum unless they want to choose a program that is completely different from their K-5 colleagues". This makes it difficult for collaboration and 5th/6th combination class teachers. “We foresaw as a District that the older configuration would continue to limit our choices of approved textbooks and, therefore learning opportunities, in the future,” said Ms.Knox. Additionally, as we reviewed the potential for reconfiguration we discovered decades of research by educators around the question: How do we best educate the 11-14 age group? “That question was the foundation of a lot our Sixth Grade Configuration committee meetings” said Ms. Knox. “We were able to discern from reviewing this research that much of what 11-14 year-olds need is Social Emotional Learning components balanced with their academic learning needs”. For example, junior high schools tend to be more subject-oriented, and middle schools tend to be more student-oriented – see graph below. The middle school has a true emphasis on educating the “whole child’, noted Ms. Knox. “Because we want to make sure our district is able to deliver those learning opportunities for our 11-14 year olds, the thing I’m most excited about is our new advisory period,” said Ms. Knox. This new component is a built-in part of the middle schooler's day. The students in this advisory period would daily participate in a smaller group, and stick with that teacher throughout the year, affording the teacher an opportunity to be their advocate and build a strong relationship and connection with the students. All OUSD families should have received Nutrition Services’ email notification (below) of free or reduced-price meals for families affected by the government shutdown. If you have any questions, or need help completing the application, please call the Nutrition Services Department at (805) 640-4300 ext. 1079 or jchessen@ojaiusd.org. We are happy to assist you. "At San Antonio, our 2nd grade classes read and discussed the book Molly's Pilgrim prior to Thanksgiving, in an effort to demonstrate to our students the diversity in our nation’s beginnings,” said Robin Monson, San Antonio Principal. After reading the book, and as an example of a multi-discipline project, Mrs. Eck's second graders each crafted a doll from a clothespin, dressing it in the traditional clothing of the doll’s country of origin. Each student also presented a story about the doll’s “life” in its native country. The project remains in the classroom, with the dolls connected to a world map, showing the origins of each family in the class. “We believe this project was an important opportunity to demonstrate to our students the incredible diversity of our classroom, and our nation, “said Ms. Monson. “Classroom discussions during and after the project focused on country of origin, and how each of us has contributed to the makeup of our country.” Other topics of classroom discussion included geography, language and family and cultural traditions. (l) Peer tutors, from right to left, Jordan Yates and Harmony Wright, work with peers every Thursday in Enrichment Classes. (r) Science Teacher Mr. Brown with student Dylan Blacker, working on his Science Career presentation in “Genius Hour” Enrichment Class. “We’re very proud of our Enrichment and Peer Tutor programs at Matilija,” said Javier Ramirez, Matilija Junior High Principal. This year, Matilija has a large group - 36 students – who have volunteered as Peer Tutors. “This program gives our students an opportunity to give back to their peers, and learn leadership and mentoring skills in the process,” noted Mr. Ramirez. In the interest of providing career-pathway education to OUSD’s students, Introduction to Hospitality and Tourism Management (HTM) has been added as a course available at Chaparral. 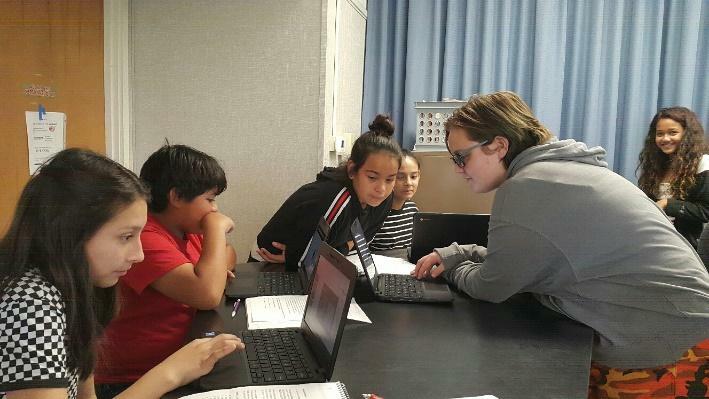 “The HTM course is one of our school’s four Career Technical Education pathways approved, and provided for, by the Ventura County Office of Education,” noted Chaparral Principal Becky Beckett. “As hospitality is the number one industry in the Ojai Valley, it seemed a perfect fit for our soon-to-be graduating students,” said Ms. Beckett. “By providing this course, we are encouraging our students to discern if this is a good career choice for them to pursue, moving forward." Beginning Fall of 2019, The Greater Good Leadership Program will be available as an elective to all students in grades 10, 11 and 12. This new one-year course of work will give students an opportunity to underscore, analyze and study, and act upon 18 character traits determined to be meaningful to today’s students and tomorrow’s leaders. “We’re very pleased to offer a new curriculum to support our initiative on Leadership, Inclusion and Character Trait Development” said Dave Monson, Nordhoff High School Principal. The research-based curriculum is being taught in over 500 schools nationwide. The course combines classroom and optional outdoor experiences, and carries University of California and California State University-approval as a G elective. “This is an extremely interactive course,” noted Mr. Monson. “Teachers will encourage students to discuss, research, blog, write, interact, and provide feedback, and students will have an opportunity to see what it means to take responsibility for actions, and earn others’ trust and respect. “Ultimately, the goal of this course doesn’t end in high school,” said Mr. Monson. “We are adopting this curriculum, with the hope and confidence that our students become more successful in their next steps; from post secondary education, through career, relationships and life.” As the class is being funded through a private grant, the cost to the school district is minimal. This course supports a growing body of research around the concept of educating the whole child. “Students are more than readers, thinkers and writers," noted Mr. Monson. "They bring unique social and emotional behaviors that cannot be separated from who they are as students. We need to consider teaching [students] important values and traits that help them develop and grow as whole people." Optional wilderness summertime experiences include the Golden Trout Wilderness School, which offers a High Sierra Wilderness experience to further develop and explore character leadership skills.